I feel like I’m the last to know, but this artist, Jon Rafman, has been collecting screen grabs of photographs from Google street views, he calls the project 9-Eyes. There are a lot, but I had to look at every single one. You’ll see what I mean when you start looking. Here is a link to Jon Rafman’s page on Artsy. I took this picture because I was noticing how every establishment, no matter how humble, makes an effort to decorate for Christmas. Damnit. Another series idea which I will never do. But now I want to do a series of these poignant Christmas tableaus, delis, etc. 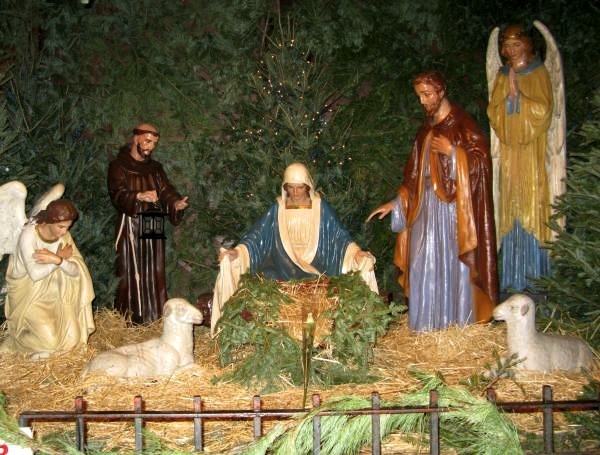 Not being Roman Catholic myself, but working for an RC organization, this is what I know about the baby Jesus in the creche: he is not put in place until Christmas Eve. OH! That makes sense! How did I not know that?? Thank you for telling us! But they should have a pregnant-looking Mary up until then. Amazing Google street views! Since our street views haven’t been updated by Google after the tornado, I can still pull it up and see how the streets looked. The first time I did that, I cried, of course. The longer it has been, the harder it is to recall the beauty of all the massive trees along our street…such a loss! I’m terrible for even suggesting that but I am RC (and actually, I like being RC), and I couldn’t help myself. 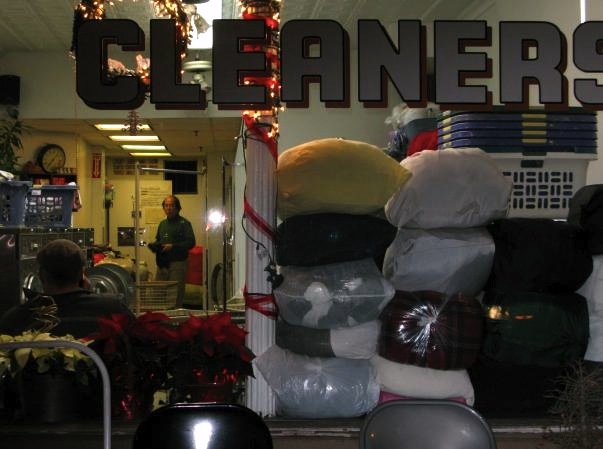 And love the Cleaners picture. Hahaha, CR. And thanks about the Cleaners picture. Cara, that is sad. I’m sorry. Have new trees been planted, or is that in the works? Hey Stacy, Yes the city is organizing for replanting of trees — but with trees that will not do damage to houses. Mostly due to where they are located, size, etc. Rebuilding continues, and every time I either drive the streets or walk my dogs, so much is being done! Some of the older historic houses have been saved, since the central part of the houses were saved, and just the porches/balconies were destroyed. It’s like watching a whole neighborhood re-invent itself, and that is fascinating. But still, it’s sad that as time passes the memory of what our neighborhood looked like before the tornado will gradually fade away. There’s a lot of people in Alabama who will have a sad Christmas due to having lost loved ones in the tornado. Fortunately, no one died in our neighborhood, which is remarkable considering the destruction suffered. Merry Christmas to you & your kitties!